Want a way to live without anxiety? According to one research program, anxiety-related issues are the number one mental health problem among women and are second only to alcohol and drug abuse among men. Stress-related ailments cost the nation $300 billion every year in medical bills and lost productivity. And use of sedative drugs like Xanax and Valium have skyrocketed in the last 15 years. Even students are feeling it. One psychologist reports that the average high school kid today has the same level of anxiety as the average psychiatric patient in the early 1950s. Chances are, you or someone you know seriously struggles with anxiety.Max writes, "The news about our anxiety is enough to make us anxious." He knows what it feels like to be overcome by the worries and fear of life, which is why he is dedicated to helping millions of readers take back control of their minds and, as a result, their lives. This 64-page booklet features practical steps from Max Lucado to help readers overcome anxiety. Eleven weekly reminders in all, each segment includes a Scripture verse for meditation, and a prayer to reframe anxious thoughts. This booklet includes a passage from the book, Anxious for Nothing, by New York Times bestselling author Max Lucado. The small trim and low price point make this booklet easy to share with friends and family who are struggling with anxiety and need a fresh perspective on how to face it.Stop letting anxiety rule the day. Join Max on the journey to true freedom and experience more joy, clarity, physical renewal, and contentment by the power of the Holy Spirit. Anxiety comes with life. But it doesn't have to dominate your life. Less Fret, More Faith Pack of 5 by Max Lucado was published by Eden bundles in February 2018 and is our 54035th best seller. The ISBN for Less Fret, More Faith Pack of 5 is EDENBUNDLE-2081. 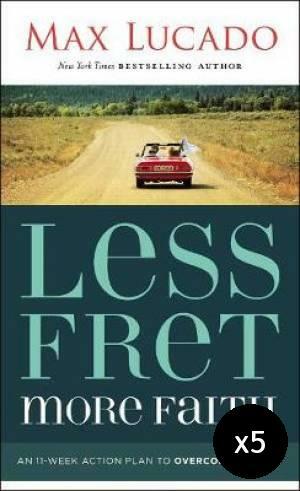 Be the first to review Less Fret, More Faith Pack of 5! Got a question? No problem! Just click here to ask us about Less Fret, More Faith Pack of 5.